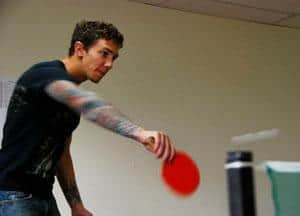 Playful perks like summer barbeques and office ping-pong tables are a given in the tech industry. Our top five companies give credence to the "work hard, play hard" cliché in the tech industry. Keep them challenged. Keep them entertained. Keep them smitten. Maintaining the interest of the primarily gen-Y workforce that powers the tech industry is like keeping a kitten glued to a game of string-ball. If they aren’t constantly engaged, they’ll lose interest and move on to the next shiny thing. Retaining employees, however, is not the biggest challenge facing high-tech companies; it’s finding the right people in the first place. To work at Strangeloop Networks Inc., a company that optimizes commercial websites (it speeds up page-loading, among other improvements), requires more than academic credentials and job experience. As Birgit Troy, vice-president of finance, explains, what university graduates learned in their first year of computer science “might be completely outdated by the time they hit the job market. For the candidates themselves, it’s particularly challenging because they need to be learning continuously and it means continuously updating their skills.” The “right fit” in this sector is always someone whose capacity for learning new things is boundless. Leadership transparency is a big part of the equation too. Employees expect to be kept in the loop on everything that is going on in the company. It’s something that Strangeloop has made a priority. “It’s a very flat hierarchy,” Troy says. “We have a very transparent management structure where everyone’s doors are always open, from our CEO down.” She believes this fosters loyalty to the product and the company. Work hard, play hard is the clichéd reality in the tech industry – so much so that the play portion almost doesn’t count in retention. The summer barbeques, the karaoke parties, the Ping-Pong boardroom tables are essentially status quo. Companies must find new ways to help employees strike their work/life balance. For example, staffers at Strangeloop might be offered the services of a concierge to handle those day-to-day chores that aren’t getting done, or they might receive generous, surprise gift certificates for nights out or short trips with their significant others.